Some time ago I bought and assembled a RepRap Prusa with the intention of using it to prototype things. It has saved me countless hours in prototyping my CNC but getting good quality prints out of it has been challenging at times. Granted my standards for good have gone up even as I've developed a hunger to print as fast as possible. 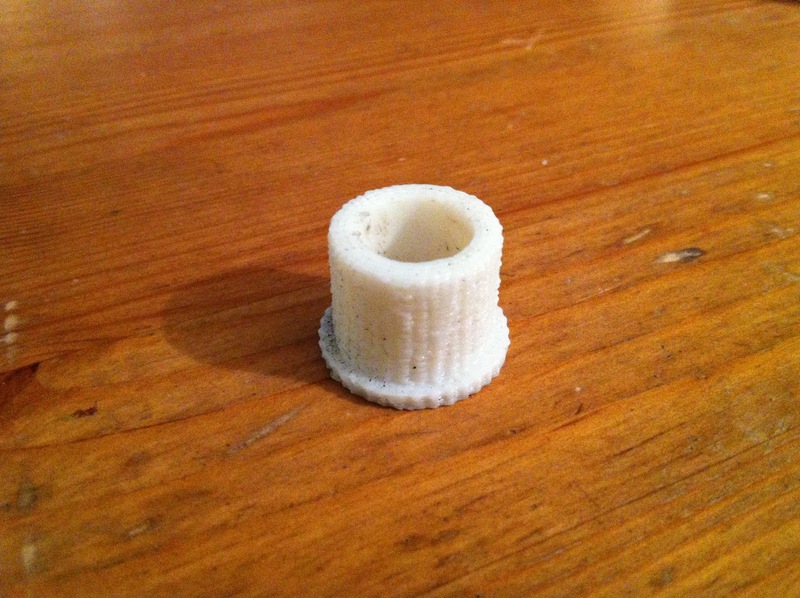 That print is supposed to be a linear bushing with circular sections, but the print is garbage due to the ridges. I tried a lot of things to reduce them, most focused on the mechanical rigidity of the printer. I tightened everything up and added diagonal braces in the X-direction. I even 'floated' the entire printer by sitting it on soft foam blocks so that the entire printer could move as a rigid body when the bed and extruder moved rather than cushioning jerk with elastic deformation. 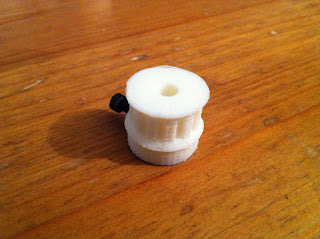 Amazingly enough, this simple idea CAN actually improve print quality for wobbly printers quite a bit, but did not fix my problem. The focus on mechanics and dynamics is probably not surprising given my background, but it turned out to be misplaced. What should have clued me in that the mechanics were not to blame is that everything got a lot worse with PLA, even when using the same travel/speed/acceleration settings that I had been using with ABS. Eventually I did realize this and started looking for extruder/heat problems, measuring and adjusting temperatures and filament diameters, changing nominal nozzle diameters and so on. None of these seemed to have any effect. Finally I ran across a post (I don't remember where I found it), that said to just print perimeters slower. This seemed crazy since i) the mechanics were sound ii) the extruder is perfectly happy running quite quickly with the beast of a stepper I have on it. But I tried it and my prints instantly got better. The difference in the photos is much more evident here and even more so in the real world. Note that all prints were made with aggressive, active cooling. So what gives? Why does the print quality improve when printing slower in PLA, even though the extruder and printer stiffness are the same that was used for ABS at much higher speeds? I have a theory, taken from the post that recommended printing slower and combined with (my own) conjecture about the print material. The theory is that communication lag between the host software and firmware causes the motion to stutter a bit, particularly on smooth curves that are discretized with many small segments. With limited lookahead, the printer does a few segments very quickly and empties its buffer before the host can refill it. This causes the printer to periodically, but regularly, stall. Since the temperature of the extruder has to be kept high to print at high speeds, the PLA in the nozzle is runny and gobs out during these stalls, creating the surface ridges. I suspect the surface imperfections are less noticeable with ABS because it generally is not as liquid as the PLA, allowing you to get away with higher feeds without noticing the buffer starvation. I should be able to test this by changing the baudrate on the printer. Doubling the send-rate should allow me to increase (ideally double) the feedrate, but will require recompiling the firmware to test. When I get a chance to test the idea out, I'll post the results. In hindsight, slowing things down was an obvious thing to try. My Prusa bobs like a cork on the soft-feet at 80 mm/s and all of my experience on other 3D printers suggests that slower printing gives improved results. But I wanted to have it all and kept increasing the feedrate. However, if I am right about this, perhaps I can go back to printing at high feeds while keeping the high print quality. Following up on my two previous posts on making Silicone molds from OOGOO, I actually managed to cast a part today. I ended up with mixed, but promising results as you will see. I started by cutting risers and sprues into the mold from my previous post. Resin is poured into the sprues and air/resin escapes through the risers. After the pour has finished, both the sprue and riser serve as reservoirs of excess resin to counteract shrinkage of the poured resin as it cures. I used West System epoxy as a casting resin, which it is not specifically intended for. It is however locally available and relatively reasonably priced. Epoxy is also one of the least objectionable resins, much less stinky than polyester resin and apparently has substantially less shrinkage. It's also easy to get the proportions right if you buy the pump kit. But on the downside, it's meant for making boats, not casting. Oh well. I don't have any pictures of pouring the resin, since I didn't want to gum up my phone, but in the photo above you can see the mold with mounting hole rods inserted and sprue/riser filled with epoxy. I used vaseline as a mold release, especially thick on the metal parts since I was concerned that the epoxy would bond to the posts and scrap not only the part but the mold as well. After pouring I plugged both holes and tumbled the mold by hand, hoping to get epoxy into all the nooks and crannies. I failed, but more on this later. I was concerned initially since my excess resin hardened quite quickly, but the resin in the mold appeared to harden much slower, judging by how gummy the resin at the top of the sprue and riser was. So I left it for about four hours and luckily everything seemed solid when I checked it. Here's the bottom half of the mold removed. 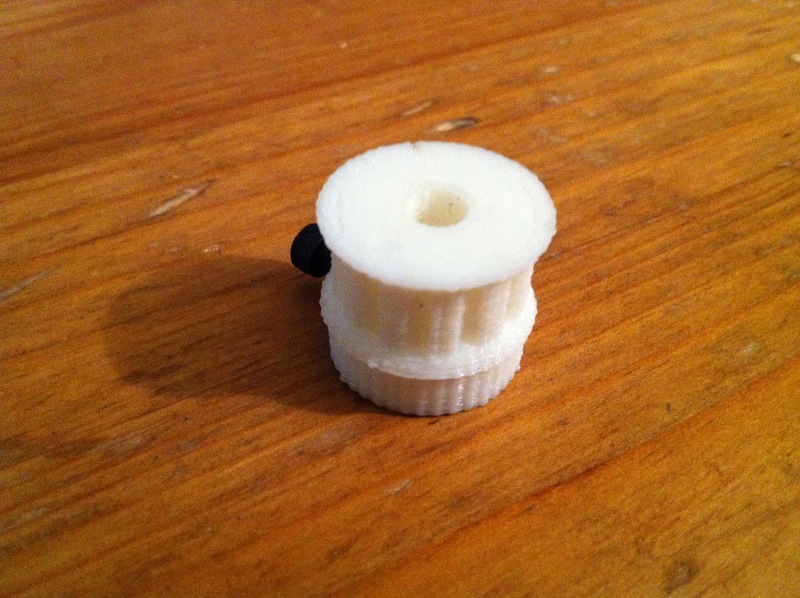 Unfortunately I ripped off the bottom half a bit too vigorously and tore the center plug. Anyway, it was only a first try. Here you can see the part almost completely separated from the mold, the only bit remaining is in the central hole which is the bit that I accidentally ripped off. The vaseline also worked really well as a release agent; a quick easy twist of the posts with some pliers and they slid out cleanly. This photo also shows the pegs left by the sprue and riser. I then cut off the sprue and riser and filed the surfaces quickly to clean up the filament marks from the mold. The bottom half of the part turned out pretty well, with only a few small bubbles. However the piece looks pretty terrible due to the residual rust from the central pegs being oxidized by the Oogoo acetic acid as well as the yellowish color of the resin, although the photo makes it look worse than it actually does. I was pleased to see that the accuracy is excellent; after a light sanding of the central hole, the linear bushing I'm using slides in perfectly with no play, although it might need a little dab of glue to keep it seated while in use. The top portion of the part did not turn out so well due to trapped air bubbles. The chunks missing in the photo above are all due to trapped bubbles, some of which are over 5mm across. That's quite big for this part, which is only about 40mm on a side. The white flecks are dust from the quick filing that is caught in the open surface bubbles. This part is good enough to be usable, but I will try to produce a better quality version. I realize now that the way I designed the mold was not the best. Rather than have the Ooogoo fill the central hole, I could have put a patterned blank in as was done for the mounting holes, making it easier to separate. Additonally, since this part only needs a single true surface, it could have been case in a single-piece mold which would have allowed me to directly see which areas were not reached by resin and also to intervene. Having this ability would allow me to avoid the spoiled corners that can be seen in the last photo. I would also spend more time on the cosmetic details of the pattern since every minor surface flaw was transferred to the mold and then to the finished part. While this doesn't effect the function of the part, it does annoy me. As an experiment, I consider this to be a success. Ugly though it may be, this part MUCH stronger than the original printed pattern. It is also dimensionally accurate with good surface reproduction, leading me to believe that Ooogoo molds with epoxy resin is a viable method for producing small-run parts, if one that requires some practice. I expect the next attempt will be considerably improved. With the success of the last attempt at Oogoo-based mold making, I decided to try it on one of the current CNC parts. The last attempt went well, but there were areas that could be improved. To that end I bought real food-coloring, to get more consistent coloring of the Oogoo. This is not important just for appearance, but also to see if it is mixed well. I also bought a small plastic box that would contain the pattern so that I could pack the mold-material into the box around the pattern and be able to apply some reasonable force locally to get surface contact without deforming the mold elsewhere. Here you can see the part with the steel rods that I'm using as patterns for the mounting holes. I then put this in the container and packed Ooogoo around it as tightly as possible. Using the plastic box really improved this step, since I could pack down the Oogoo without separating the mold from the pattern somewhere else. I then pulled out the pattern rods, slit one side of the through-hole and pulled out the pattern. The surface quality is excellent, you can see the individual filaments of the printed part, as well as some 'flashing' where the pattern rods for the mounting holes didn't exactly meet the center hole. You can also see where the acetic acid rusted the mounting hole peg. Not sure how to avoid this, it seems to happen even when the pegs are oiled with vegetable oil (to act as a a release agent). The top of the mold also shows filament marks. Perhaps next time I'll fill the surface a bit and sand it down to improve the surface quality. Anyway, the next step will be to cut sprues and risers to get the resin in and out of the mold. I hope to try out actually casting parts in the next few days once I get some resin. Having finally gotten the CNC up and running, I'm kind of interested in seeing how to manufacture it cheaply and quickly. The design of the machine centers around 3D printed plastic parts that bolt to aluminum cheeseplates. These printed parts are the weakest parts of the machine; they are great in the sense that you can build a mill without owning a mill, but bad because the strength simply isn't there. They are also time-consuming to print: most parts take 30min each or so, meaning that to make a copy would take a couple days or so. The partially assembled machine is shown below, everything white is 3D printed, and most of the parts are not actually visible. Enter casting. Cast parts can solve a few of these problems. Cast parts are likely to be much stronger than the 3D prints because the parts will be solid material and less prone to delamination than the current parts. They can also be made relatively quickly using epoxy or polyester resins, which set very quickly. Not much faster than the individual prints take, but multiple parts can be cast in parallel, so an entire axis could be cast at once and be ready in a an hour or so, instead of closer to 8 right now. Cast parts can be further strengthened by the addition of chopped glass fibers, yielding FRC or FRP (fiber-reinforced composite/plastic) parts, although this will add considerable complexity to the process and likely require vacuum-assisted resin-transfer molding. A downside is that the casting materials and resins can be quite expensive. Wanting to get my feet wet, I turned to OOGOO, a Sugru substitute made from Silicone caulking, corn-starch and food coloring (actually I used Mio water flavor to color the first batch). Below you can see the first test, including all ingredients and the first part still en-molded. It is important to get the right caulking. You want clear 100% silicone caulking, with no anti-fungal additives, and preferably a brand that mentions that it will stink of acetic acid (or is 'acid-cure'). 'Neutral-cure' is a no-no, as is acrylic caulking. At first I tried GE Silicone II but this failed to properly set. GE Silicone 1 is what I eventually ended up using with good results, which is good because it's about $4 per 300 mL, making it one of the cheapest caulks there. I don't have photos during the process because it was astonishingly messy, but can say that I mixed roughly 2:1 cornstarch to silicone by volume after adding mixing a few drops of water and coloring to the silicone. You don't have to add coloring, but it helps you tell if the stuff is well mixed once you add the cornstarch. Mixing the cornstarch is hard work, particularly in quantity, but you want a consistently colored, pastry like result. Basically as you mix, you want the stuff to kind of tear and crumble at first but eventually reform and blend together. Here you can see the pattern still embedded in half of the mold and then fully separated. I used vegetable oil as release agent on the pattern prior to making the mold; this worked well, but it is hard to get the Oogoo around the part without also rubbing oil on the Oogoo surfaces that should not have release agent on them while building the mold. I will have to learn how to deal with this for the next part. Dimensional tolerances appear to be quite good, there is a firm friction fit between the patten and mold material. In the photo immediately above, you can see that I wasn't able to get the Oogoo all the way into the slot of the part, but this could be easily fixed with a handsaw on the finished part. With the pattern removed, the rods can be reinserted into the mold to create the impression for the mounting holds. Provided the casting resin has low-enough viscosity, it will then easily flow around these posts to create the mounting holes. I found it interesting to see that the acetic acid produced by the curing caulking actually corroded the post patterns, which you can see above by the discoloration of the steel posts where they were in contact with the Oogoo and by the rust-stains on the Oogoo itself. Anyway, this process seems like it has great promise. It's easy to work with, very cheap (less than $8 per pound) and seems to give quite accurate results. The final molds are predominately silicone too, which has high heat resistance for the eventual polyester resin casting (I have seen large amounts of resin actually auto-ignite due to the exothermic reaction as the resin 'kicks'). I intend to keep playing with this stuff and hopefully end up with a reasonable method for performing casting of printed parts in the near future. Since finding the big C-channel piece that makes up the base of the machine, I've always planned to build the electronics into the base to give a nice, compact and clean machine. I'd been waiting for a power-supply to arrive before doing this, but last week it came so I got to work. The electronics are currently mounted to a piece of plywood that hooks on a key at one end and has bolt holes to bolt to some 3D printed plastic standoffs. It fits into the base pretty nicely. Running approximately left-to-right, you can see the Arduino running GRBL, the three stepper driver carrier boards, a solid-state AC relay for spindle control as well as the power-supply and finally the E-stop button. All the mains power is wired with 14 gauge household wiring connected with Marretts. The E-stop button cuts all mains power to the power-supply and relay, thus rapidly immobilizing the machine. The Arduino is unaffected by the E-stop, being powered from USB. In this way, the E-stop also functions as an optional operator stop, allowing you to de-energize the machine, reposition it manually or change tools and then start it back up, knowing that it won't starting moving or cutting with your hands in there. Looking from the back, the USB socket for the Arduino is accessible, as is the scavenged spindle socket and power cable. In a subsequent revision I plan to replace these with panel-mount components, but I couldn't locate them locally last week. It's still a bit ghetto, but quite functional and self-contained at this point. I intend to finalize the electronics layout and then make a sheet-metal replacement for the plywood with front and back panels and all panel-mount components. But for the moment, it's working pretty well and I can easily pick it up and move it without rewiring the whole thing. The other, straightforward, addition was cable drags on all the axes. This has really helped to clean up the machine, giving me something that looks more like an actual tool than before. Hopefully I will be able to start using it for projects soon.